Learn Spanish in Cuenca Ecuador. Super Spanish teacher, Rick Brown, will be teaching a Super Thinking + Spanish course in Cuenca Ecuador June 2,3, 4, 2017. Click here to attend both Super Thinking + Spanish June 2,3,4, 2017. Super Thinking + Spanish $349. Super Thinking + Spanish Couple $649. 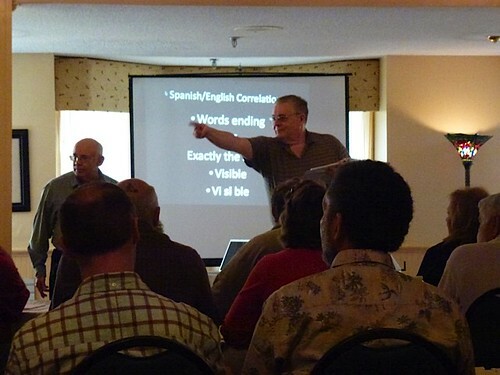 What prompted Rick Brown to first take the Super thinking + Spanish course was a trip to Ecuador where he had some issues communicating. Rick was born in the province of Quebec and moved to the Greater Toronto Area in 1983. He traveled all over Canada during his twenty one year Military service. He has also visited Germany, Scotland, England, France Italy and Moneco, the USA and Ecuador. Having spent the last thirty five years in the IT field, Rick is currently working for a Municipal Government in Ontario Canada where he is a Network Administrator and helps manage the Enterprise Data Centre and the Enterprise Backup for his group. An interest in exporting his retirement south led Rick to us. He attended several courses and tours with us in Ecuador and came back for more the following year. He then joined our course to broaden his Spanish skills and wound up enrolling in Teacher Training course and now teaches Spanish. Rick has worked in English, French and now Spanish. He looks forward to helping you to reach out and grasp Spanish as well. What prompted Rick to first take the Super thinking + Spanish course was his first trip to Ecuador where he had some issues communicating. He was quite impressed with the Super Thinking aspects of the lessons and wanted to learn more especially on the aspects of Whole Brain Learning.